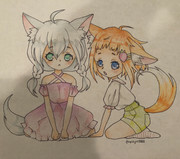 i drew and colored a couple of little fox girls! Awwww. They are really pretty. Great work <3 I really love the one in the pink dress. She's super cute and I love her dress. Those are really good! I love foxes!! The shading was done well and so was the colors. Insanely adorable. Do you have any more?